Urticaria (hives & itchy skin rash). Age: Children under 12 years. Age: Adults and children aged 12 years and over. Dose: Take one capsule once a day. Do not chew the capsule. Swallow the capsule with a drink of water. 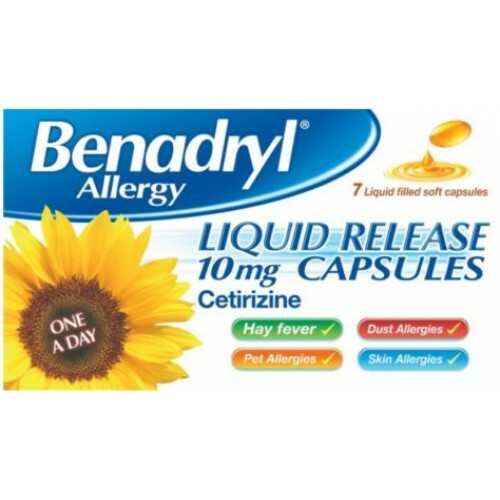 Benadryl Allergy Liquid Release 10mg Capsules, at the recommended dose, do not cause drowsiness in the majority of people. However, as with other antihistamines, rare cases of drowsiness have been reported. If affected do not drive or operate machinery. 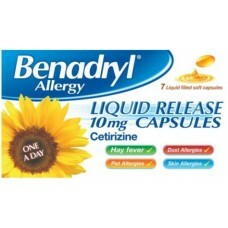 As with all antihistamines, you should avoid excessive alcohol consumption when taking this medicine. Warning: DO NOT EXCEED STATED DOSE. As with all medicines, if you are pregnant or breast-feeding, consult your doctor before taking this product. If symptoms persist, consult your doctor or pharmacist. Store below 30°C.